Option 3 – Tories taken to task over Capita! 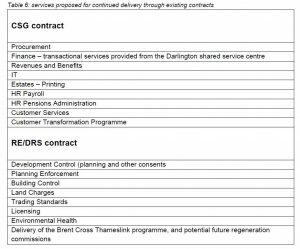 Tory councillors, forced to review their outsourcing arrangements with failling privateers Capita due the scale of the disaster, walked away with their tales between their legs after a mauling at town hall Resources Committee. 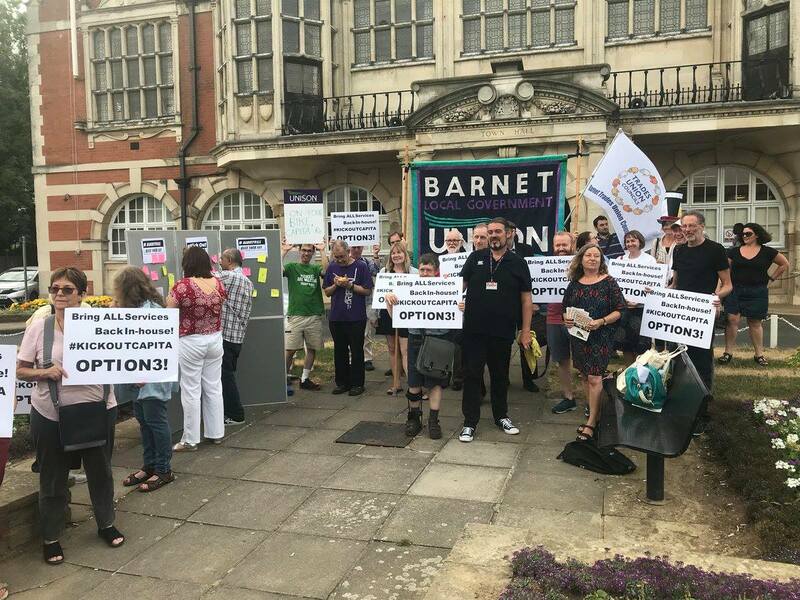 Barnet Alliance for Public Services activists and Labour councillors, who held a lively rally outside before the meeting. By the end, the Conservatives had been forced to carry out a fully analysis of the costs and possibilities of kicking out Capita all together. In the meeting itself, the Tories were virtually lost for words, as they have reneged on almost everything they had said in the local elections in May. After pledging to maintain low council tax, they are now looking to make the largest tax rises allowed in law. When it was pointed out that they had frozen council taxes for years, and that council officers’ reports had shown that funding was in trouble months ago. they responded by pathetically appealing to the Labour group and residents not to “hark on about the past” and then trying to blame the economic policies of Gorden Brown in the same breath! The preferred solution for this crisis-ridden administration was to do a partial reversion of services back t public control, which would have left Capita with those elements of services that are mostly profitable to them. By the end of the meeting, they were forced to conceed that no option for in-sourcing should be off the table in order to save our borough. This a massive step forward for our movement! See a good report on the meeting in the Barnet Times here. This is a formal notification of BAPS AGM and relaunch, which will take place on Wednesday 4th July 6.30 pm at the Greek Cypriot Centre 2 Britannia Road N12 9RU. 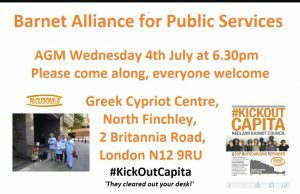 The Return of Barnet Alliance for Public Services: Time to Kick Out Capita! Last night, one of London’s longest running anti-austerity campaigns reconvened with a packed meeting at Finchley’s Greek Cypriot Centre. 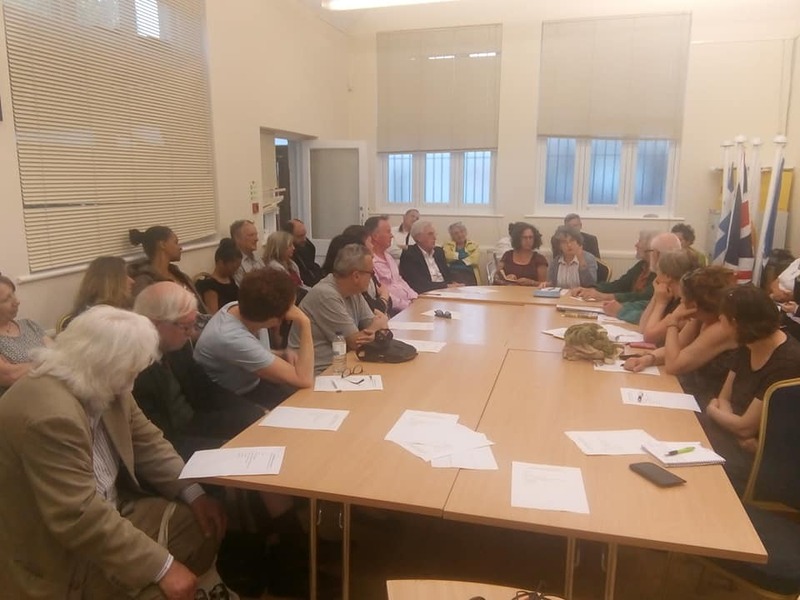 At our last trades council meeting on Thursday, we had resolved to get organising the re-elected Tory council as soon as possible, and this was an excellent start. The initial presentation came from the one and only Mr Reasonable, John Dix, who had a comprehensive report on just how bad the past five years of mismanagement by Capita, the woefully incompetent and self-serving outsourcing giant to which the Conservatives have entrusted almost our entire borough. 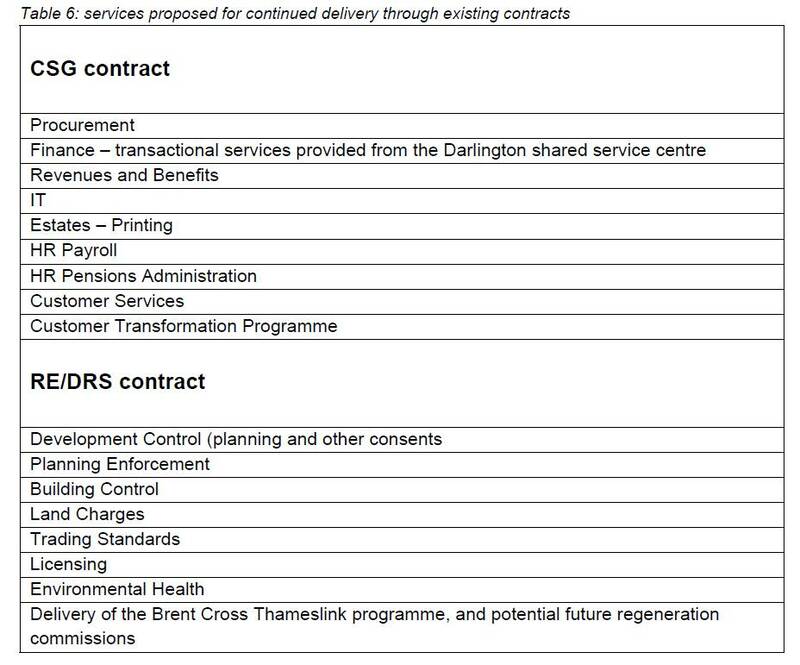 The Tories claim that the deal saves money, which might even be true if over-billing, contract variation and “special projects” weren’t absolutely rife. Combine this with the Tories failing to make even the most limited council tax rises for many years (even when their associates in other councils were doing so!) 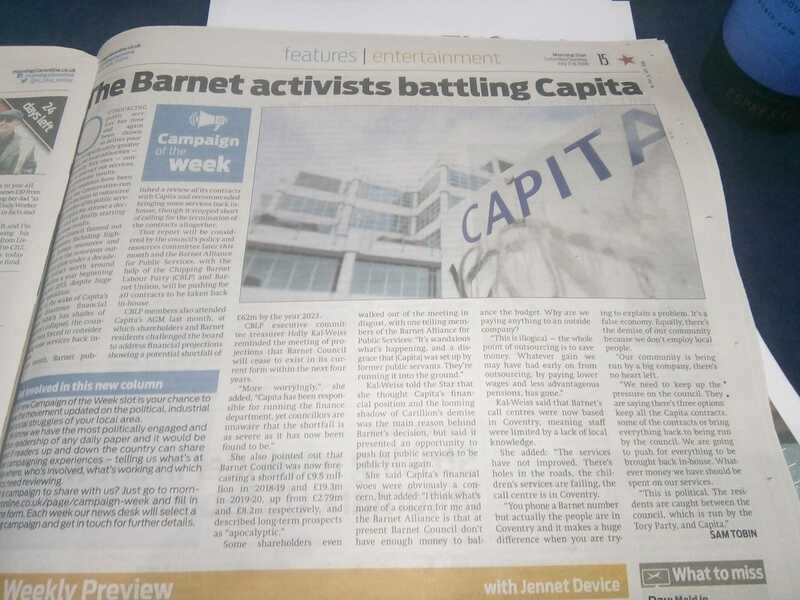 and the fact that Capita fees, astonishingly, rise with RPI inflation and there is a multi-million pound shortfall coming in Barnet’s finances. Auditors have expressed severe doubts that the Tories can possibly fill the gap by 2020 or 2021. You can read John’s full report on his blog. John was followed by fellow campaigning blogger, Roger Titchbourne of the Barnet Eye. 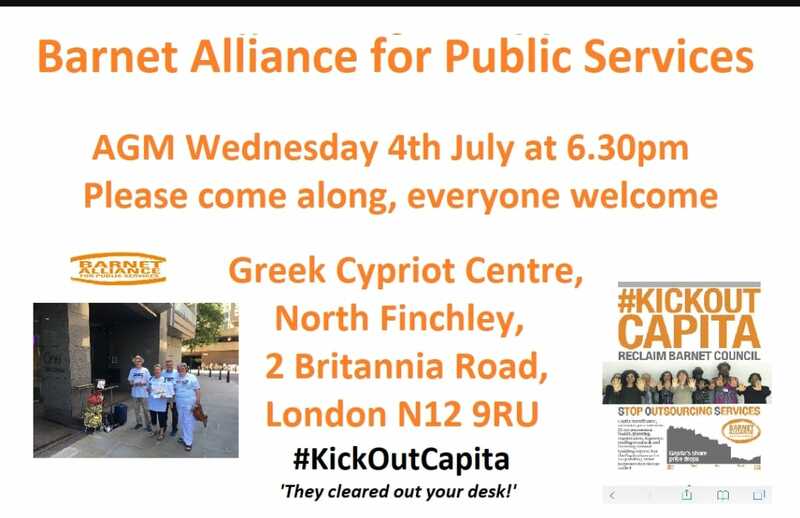 Roger issued a call to arms for activists from across the movement and different parties to unite under a simple slogan: Kick Out Capita! This is going to be the new focus for BAPS, and we’ll be starting with a series of musical and cultural events around the borough. Labour intends to crack-down on the massive tax evasion and money laundering that goes on in London, which is estimated to be of the order of £92 million annually and strongly tied to international crime. Labour has realised that simply dragging voters to the polls when election day comes will not win the next election. There has to be a turn to community activism and the party is appointing community organisers to help make this happen. There has to be a renewed assertion of a right to a commons in Britain – including of land itself – in order to make society more just, and Labour is working with figure like George Monbiot on policy. The relaunch was an excellent step in the right direction. Now we have to get the message out there and take the fight to Capita. BAPS will now be meeting every Tuesday at 6.30pm in the Cypriot Centre. 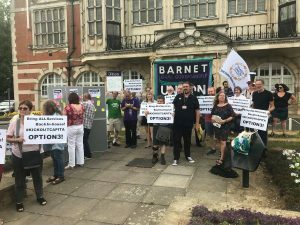 Why not come along and join the movement against corporate greed to make Barnet a better place to live?